Owning a hot tub is like having a personal hot spring vacation right in your comfort zone, for perfect relaxing and easing of sore muscles and joints after a stressful day at work. Making a decision in purchasing your own hydrotherapy massage tub, choosing the right one is a bit difficult task with so many options on the market. This guide will provide an informed and confident purchase when buying a hot tub in 2019. The Coleman SaluSpa Inflatable Hot Tub is among one of best the portable Jacuzzi that has attracted many customers on the global market. It is well known for its recognizable green color, as its trademark and used mostly in all their products. 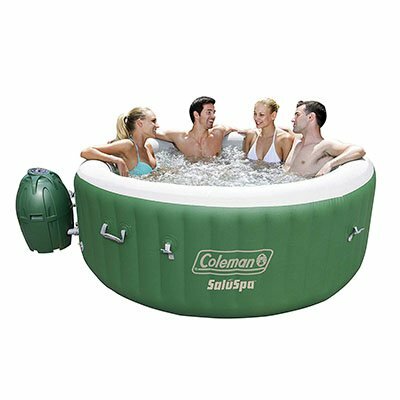 The Coleman SaluSpa Inflatable Hot Tub is visually appealing, refreshing, durable and long lasting inflatable hot tub, with a nice design and incredible features and utilities that would certainly help in the relief of stress work day. This will provide you with an easily cool spot in relaxation after the day’s job and can contain about 4-6 persons. However, it can fit into a family’s budget due to the fact that it is cheaper and affordable to buy in the market. Salu-Spa Palm spring air jet inflatable 6-person hot tub is one of the best hot tubs with full tranquility, comfort, and luxury, which makes it the perfect choice. This is the unbranded version of the Coleman SaluSpa Inflatable Hot Tub. Salu-Spa Palm spring hot tub comes with a premium leather look, mellow color and a leather that reflects its high-end specifications extra-luxurious features. The SaluSpa Palm Springs has an easy setup and can be used either indoor or outdoor within a period. It has a digital control panel that makes operating easy, with an automatic on and off button for controlling the temperature. Salu-Spa Palm hot tub has a maximum heating temperature of 104°F, with a high-quality massage system for relaxation and comfort and is perfect for sore muscles. The Salu-Spa Palm springs do not require tools or professional installations and have a more spacious room for movement. The size of Salu-Spa Palm spring is 28inch X 77inch X 77inch and weighs 1,225kg. Salu-Spa has a capacity of 4-6 adults and a water capacity of 963L (254 gallons), with an actual water flow rate of more than 1,211L/hour. It has a gross weight of 37.8kg and is ETL approved. It has a rapid heating system of approximately 2-3°F/hour. The Salu-Spa has an electrical rating of 110-120V with a 60Hertz and a 12A at a temperature of 68°F. Salu-Spa Palm spring has a well-constructed wall that offers great and extra durability and strength, with a perfect resistant and made of I-Beam construction. This provides a better sitting position without the Spa bending, making this product superior to others. The Salu-Spa Palm spring air jet inflatable 6-person hot tub comes with an insulated cover that maintains the optimal temperature and also prevents micro-organisms from entering. It possesses a high filter system with two filtered cartridges which provides filtration of water and a chemical floater that which is used in the sterilization of water. 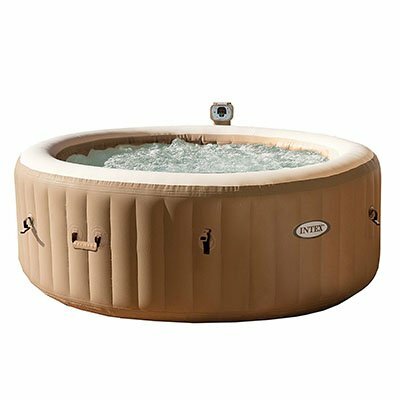 Intex 77in Pure-Spa Portable Bubble Massage Spa Set is among one of the best hot tub baths, its exterior is colored tan and has a light cream in the interior and round in shape. Thinking about relaxation you can count on Intex 77in Pure-Spa Portable Bubble Massage Spa Set, which has a built-in hard water system that is well treated and has a soothing gentler experience on the skin. The Pure-Spa has the capacity to carry four adults, with a water capacity of 210 gallons (955 liters of water), and water maximum temperature of 104°F. The Intex 77in Pure-Spa massage hot tub has a heating system of 1300 watts, with a temperature of 2-3°F that keeps the water warm, a 3-way test strip to check for the cleanliness of the water, and 2 cartridge filters that are changed on a daily basis after the removal of the water. It also has a simple digital control panel that contains the temperature control button and the on and off switch that is all covered by a plastic. It comes with 120 heated bubble jets that help in the massage of the body and is located within the interior. The Intex 77in Pure-Spa also contains an insulated cover that keeps the water warmth and prevents it from micro-organisms contamination, which contains a self-locking system. It has floating chlorine pool dispenser that treats the water and kills microorganisms’. The durability of the Intex 77in Pure-Spa is attributed to its high-quality fiber tech construction and puncture resistant 3-ply laminated materials. 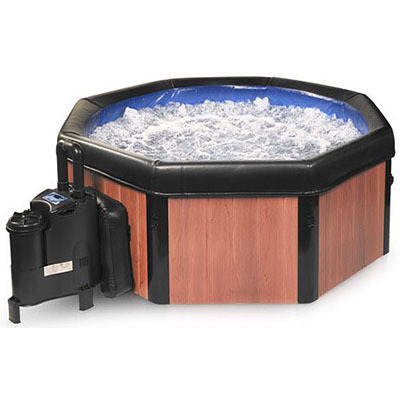 The Intex 77in Pure-Spa comes with thermal ground cloth that is placed under the tub, an inflation hose that is used for a quick set of the hot tub, and a carrying bag (with a dimensions of 14 X 14 X 34inch) that is used in the packing of the tub during winter storage or moving to a new location, with grab handles for comfort and easy transportation. The Intex 77in Pure-Spa has a DVD complete installation package, for easy installation and has a market name called the “Plug and Play Hot Tub.” Intex 77in Pure-Spa has a flow rate of about 460 gallons/hour, with an Air bubble blower rate of 110-120 Volts. It has an approximated inflated size of 57inch X 77inch X 28inch and weighs about 87.2lbs. 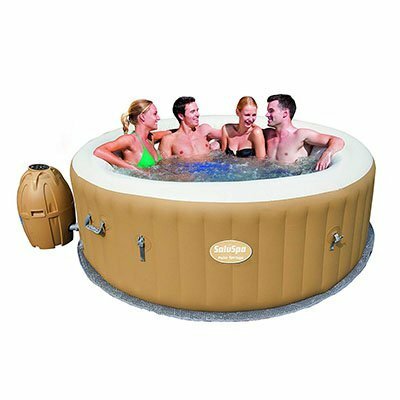 Bestway SaluSpa 4-Person Inflatable Portable Hot Tub is a low price hot tub which provides good relaxation after a long day at work. It gives a comfortable support for individuals and relaxation to the neck and back muscles. The Bestway SaluSpa 4-Person Inflatable Portable is among the best hot tub that just entered the market recently and has attracted a lot of person’s due to it affordability and comfort you get. The Bestway SaluSpa 4-Person Inflatable Portable has a capacity of accommodating 4 persons, with a water capacity of about 211 gallons which is about 959.23L of water. The water maximum temperature range for this hot tub is from 68-104°F. It has a rapid heating system that helps keep the water warm in the hot tub, and requires some time to heat up the water. It weighs 70.6lbs without water in it, and has a size of 18.11inch X 33.86inch X 23.62inch without been inflated, but when inflated it has a size of 26inch X 71inch. The led control panel made it more easy to use in adjustment of temperature and check filtration status. 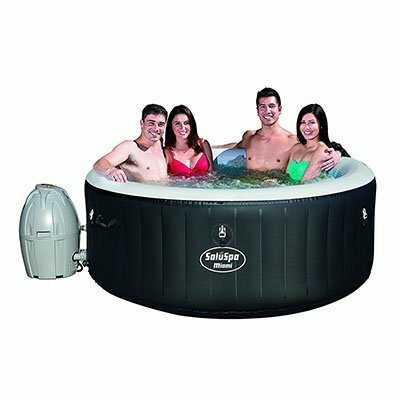 The Bestway SaluSpa 4-Person Inflatable Portable comes with a Salu-Spa massage which gives a cool massage on sore muscles, and also has an integrated water filtration system that is use in the cleaning and removing of used water from the tub. The Salu-Spa does not have seats which means that there is more space for standing or sitting as the individual’s like. Its drainage system is cool and comes with a cushioned floor that makes it easier to drain quickly, and comes with floater that is adjusting and maintaining of chemicals easier. The Bestway SaluSpa 4-Person Inflatable Portable is made with a high durable material which provides a better comfort as a result of its sturdy wall. It requires a direct plugging to electricity and comes a 110-120 volts plugins. It comes with a pump, for pumping of water directly in the tub and a DVD for easy installation which requires less than 20minutes. It has a pool cover and chemical floater that is used in both sterilization of water and prevention of micro-organisms from contaminating the water. It has an Air jet system with 120 bubble jets unique to that of the Lay-Z-Spa’s I- beam technology and Tritech material to ensure strength. It is light and easy for transporting from one location to another, and a flat smooth location capable of uniformly supporting its filled weight. The Spa-N-A-Box portable Spa is a product of comfort line that makes life better and more comfortable. The Spa-N-A-Box is a hot tub that gives an hourly turbo wave massage, with good relaxation and hydrotherapeutic action, with a soft cushioned interior that is safe and comfortable. It is well known for its rejuvenating effects in the body; such as increasing blood circulation, Soothing of tight muscles, stimulating the release of endorphin's production and promotes productivity. The Spa-N-A-Box portable Spa measures about 74inch X 74inch X 27inch when it is inflated and has a weight of 71pounds (32.20kg). It is an easy to use hot tubs, which takes less than 20 minutes to set up. It is made from durable and long lasting materials, which makes it more sturdy and comfortable with a relaxing massage. The Spa-N-A-Box portable spa has a capacity of 4 persons and can take about 280 gallons of water and is hexagonal in shape and made up of redwood stained cedar panels, which resists insects and also withstand the weather condition of extremity. The Spa-N-A-Box portable Spa has 127 micro air jets, and 1hp turbo wavers blower, which provides the vigorous overall body massage, with the provision of warm water relaxation without turbo waving running. The heater systems are about 1000 watts and heat up about 104°F, which provides the warmth of the water using water pressure system. It has a water filtration system that keeps clean water running at all times, and comes with a 110-volt ground fault interrupter built onto power cord, which is 10 feet long. It requires 12Amps, with the heater in operating at 24 to 48 hours to reach its operational temperature. The Spa-N-A-Box portable Spa possesses a soft insulated cover that protects the Spa from the elements, dirt, micro-organisms and has a lock for added security that makes it more convenient. It has a thermal insulated cover and a starter filter kit for filtration of water and changing water twice monthly with the extra filters. It has a chemical kit that is sold separately, which is the use of the setting up of the tub. It comes with a manual for the general setup process.